Yesterday was our school Christmas Fayre, and what a fabulous--but tiring--day it was! I foolishly said that I'd run refreshments--remind me to sit on my hands next year--so spent half of the day yesterday setting up the stall, artfully arranging cakes, and heaving around the rest of the stock. I really wish that I'd remembered to take a picture of the finished stall as it looked really pretty! I crocheted a "paper chain" garland to swag along the front of the stand as well which several people said really nice things about. I snapped this picture of my Chocolate-Peppermint Slice fresh out of the tin. I am still kicking myself for not taking a picture of it cut up nicely!! I also made some Chocolate Tiffin and some cupcakes. The Fayre itself passed in a total blur. I remember serving the first cups of tea, seeing Dave, Lucas, his cousins and Nanny for a few minutes, and then all of a sudden the cakes were all gone and everyone was feasting on mulled wine and mince pies, and then the binbags and brooms came out... I'm keeping my fingers crossed that we've made pots and pots of money for the school! Just after Lucas went to bed tonight, we heard Christmas carols being played at full blast. Just as I was about to get cross, I heard Dave tell Lucas to look out of his bedroom window quickly! Being nosey, I ran to look, too! 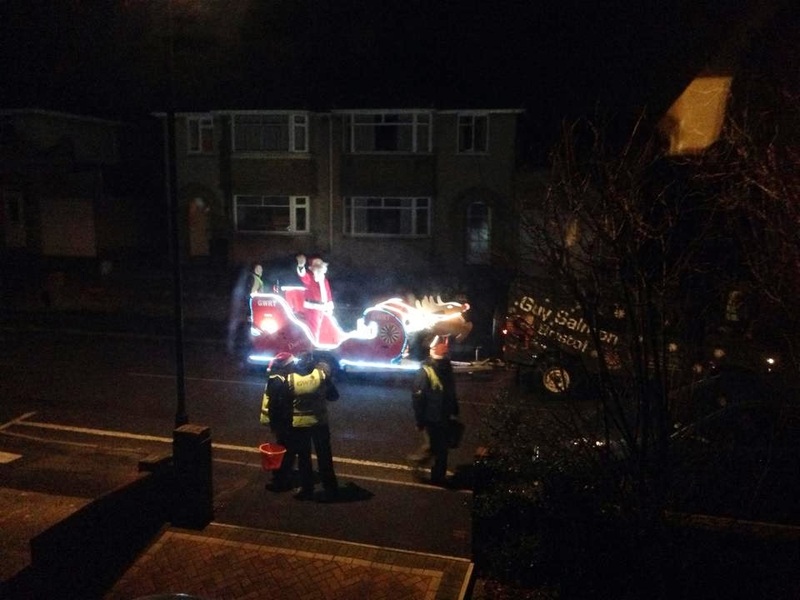 The Great Western Round Table were helping Father Christmas warm up his sleigh in preparation for The Big Night. Lucas ran downstairs and we waited at the door. Lucas's face was an absolute picture when Father Christmas waved right at him! A lovely end to the weekend! It was pretty epic! I'll probably make another batch closer to Christmas so that we can all have a taste. I only got to taste the crumbs!! 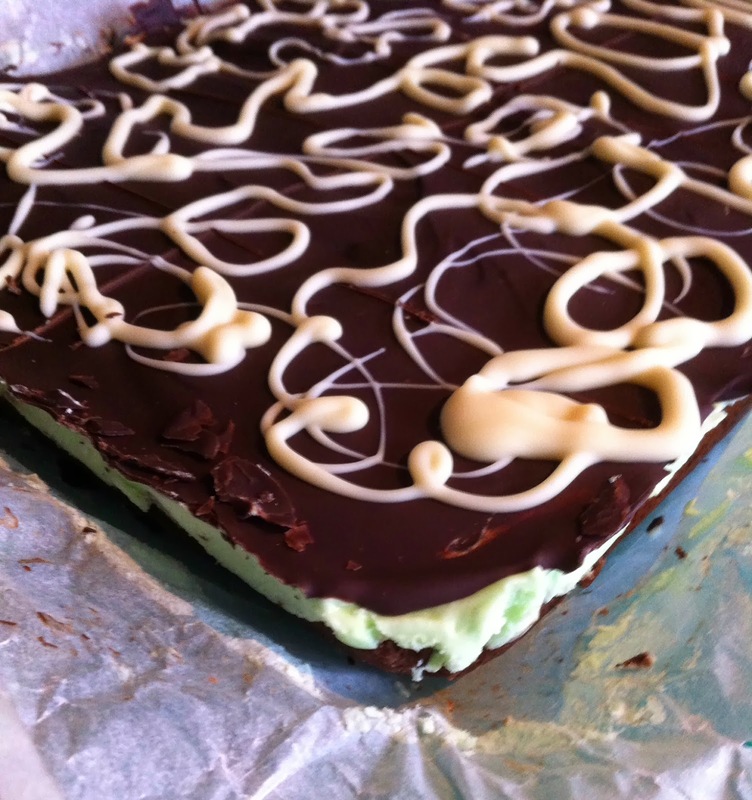 I can't even handle that chocolate peppermint slice! Seriously. Wow. It's totally worth making, Tamara! !